Sitting and checking your Facebook updates or reading email is not nothing. Today we are all so wired and connected that we forget to slow down. If we don’t slow down, though, we don’t recharge, which keeps us from being at our best. Feed the birds. In “Mary Poppins” an old lady sits on the steps of St. Paul’s and sings, “Feed the birds, tuppence a bag.” It’s good advice. I have several bird feeders and I sit and watch the birds come to eat. It’s fun to identify them and watch how they interact with each other. I often sit for 20 minutes or longer simply watching. I don’t think about anything. Unplan your vacation. Yes, you need a destination and you should know something about where you are going and where you will stay. But after that, don’t plan anything. Wake up each morning and then decide. Better yet, walk out the door of your hotel and start walking. We did that once in London and came upon the premiere of one of the Star Wars movies. Outside the theater were Storm Troopers so we had our photo taken. I think that day we had planned to go to the Tower of London. It’s been there since 1078, but how often do you get to hang out with Storm Troopers? Eat at a table. This does not mean your desk. Take time to eat lunch. In the evenings, even if you pick-up your dinner, sit down at the table and eat it, preferably with no television. If you ordered carry out, take the food out of the plastic and Styrofoam and put it on a plate. Enjoy the taste, the sight and the smell of your food. In other words, slow down and savor the meal. Adult coloring books are a great way to slow down (photo by Cynthia Price). Connect with nature. This can be anything from walking in a park to planting a small garden. If you don’t have room for a garden join a community garden. The idea is to play in the dirt, feel the grass beneath your feet and look up at the sun and clouds. Color. The latest trend is coloring books for adults. I’ve been coloring my entire life. I have always find it relaxing. I guess I was just a head of the trend. I often purchase a child’s coloring book from the dollar store, but now there is an entire line of coloring books for adults. 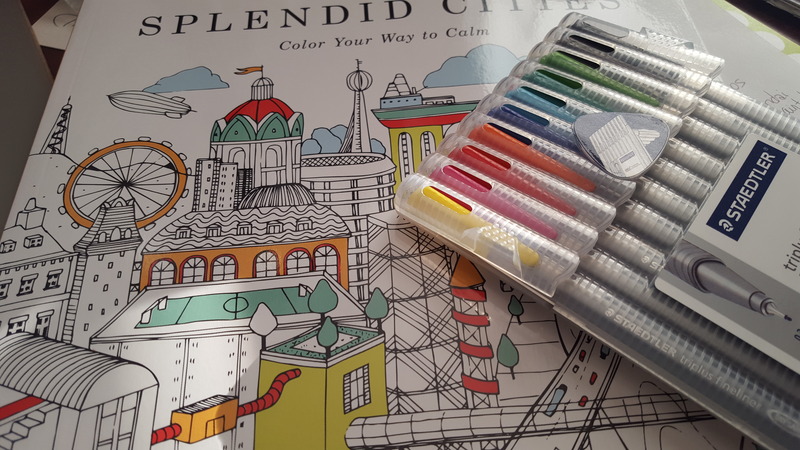 I just bought “Splendid Cities: Color Your Way to Calm” by Rosie Goodwin and Alice Chadwick (artists). Not only does it relax me it lets me daydream about my next travel destination. How do you find your slow? I’ve always been a fan of coloring to relieve stress. Great ideas here from my friend Cynthia…we all need to slow down a little more. How do you do it?